I thought I’d try my hand at a little Easter DIY. Something pretty for the table come Sunday. 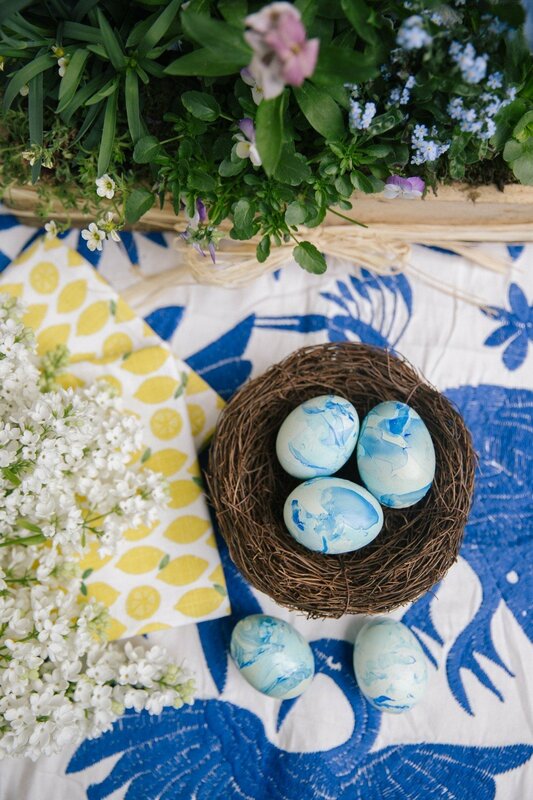 I think painted eggs are an eggcellent choice for a festive centrepiece. Eggsactly what the table’s crying out for! Incase you feel the same way, I thought I’d share how I made them. I used two processes, one natural, one artificial. They’re really very easy but a little fiddly. You’ll need to start by blowing your eggs (removing the egg from the shell). Take an egg and make a pin prick in the top and bottom. Use your cocktail stick or skewer to very carefully make the bottom hole slightly bigger. Big enough to slide the stick in and scramble the yolk. Hold the egg over a bowl and blow through the top pin prick. The egg should pour out of the bottom, once clear run under the tap and blow out any excess water. Return to the egg box to dry off and do the same with the rest. Once they’re all blown you can get ready to marble! Fill a plastic pot with tepid water (not cold – it won’t work with cold), pour a few swirls of each nail polish shade onto the water’s surface. Using the skewer (or your fingers if you find it too fiddly), dunk the egg into the polish and turn until it’s all covered. Carefully remove and set to one side to dry. Keep going until your eggs are all marbled. Now you’re free to use them as decoration for years to come! They’ll never “go off” so you can treat them a bit like Christmas decorations, to be brought out every Easter Sunday as part of your own little tradition. Display them in egg cups in people’s place settings, pile them into a basket or hide them around the garden! Or just pop them into the flowers on the table. If spoiling your manicure sounds like more effort than it’s worth, well I have another suggestion. It turns out that contrary to popular opinion, naturally dyed eggs are far easier than artificially dyed ones! All they require is time, which means you can put your feet up with a glass of wine. Say hello to my Hard Boiled Dragon’s Eggs. Totally edible, totally natural, totally Pinterest inspired, and a total breeze to make. Roughly chop your red cabbage and pop into a large saucepan with enough water to cover it. Drain the cabbage, keeping the water! Leave the water to one side to cool in two regular dessert bowls. While it’s cooling you can boil your eggs. Place them into a pan with enough cool water to cover them. Place onto a medium/high heat and bring to the boil. Once boiling put the timer on for 6 mins. Once the water’s cool and the eggs are cooked – place the eggs into the water and leave for two hours. After two hours, fish the eggs out with a spoon and gently roll around on paper towels to dry. Take a second to admire your handiwork and the pure genius of natural dyes! Now, the easiest way to get at your eggs to add the gold flecks is by making them little stands. Poke 4 pins into cardboard in a little square – just big enough for the base of your egg. Dip your dry toothbrush into a splodge of gold paint and use your thumb to flick it onto the eggs. Leave to dry, it should only take a couple of minutes. And they’re ready to serve! Serve as part of your Easter breakfast with hot buttered toast. Alternatively keep chilled in the fridge until you’re ready for them. 2 days is about the max I’d leave them. The prettiest addition to any table. And a hit with guests of all ages!